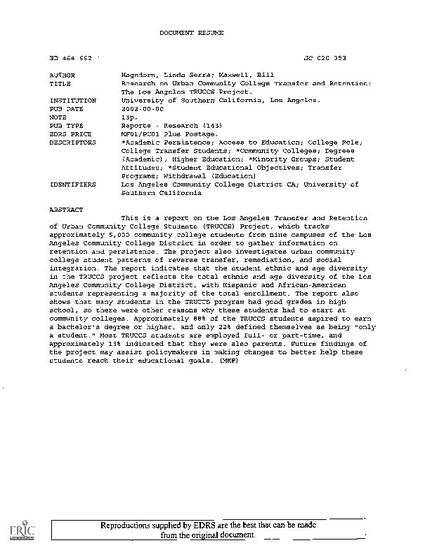 This is a report on the Los Angeles Transfer and Retention of Urban Community College Students (TRUCCS) Project, which tracks approximately 5,000 community college students from nine campuses of the Los Angeles Community College District in order to gather information on retention and persistence. The project also investigates urban community college student patterns of reverse transfer, remediation, and social integration. The report indicates that the student ethnic and age diversity in the TRUCCS project reflects the total ethnic and age diversity of the Los Angeles Community College District, with Hispanic and African-American students representing a majority of the total enrollment. The report also shows that many students in the TRUCCS program had good grades in high school, so there were other reasons why these students had to start at community colleges. Approximately 88% of the TRUCCS students aspired to earn a bachelor's degree or higher, and only 22% defined themselves as being "only a student." Most TRUCCS students are employed full- or part-time, and approximately 15% indicated that they were also parents. Future findings of the project may assist policymakers in making changes to better help these students reach their educational goals.